I'm very fond of this time of year. Despite the cacky wind and rain, there are exciting things just around the corner. I love it when the shops start to get in the Halloween gear, treacle toffee, pumpkins and dare I say it... Christmas stuff! I love the falling leaves, conkers and wrapping up warm. I don't like hats. They flatten my already temperamental fringe. This cake is perfect for Halloween, Thanksgiving or just the colder months in general. 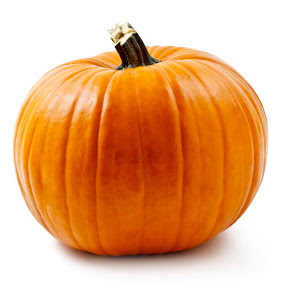 And for those of you thinking 'I hate pumpkin!'... it doesn't taste of pumpkin, just like carrot cake doesn't taste like carrots. The pumpkin puree adds moisture, texture and sweetness to the finished cake. The spices add depth and make it the perfect partner to a nice cup of tea. This cake is much lighter than some of my other bundt recipes, so is best done in fluted or plain tins rather than the really intricate ones. Grease and flour a regular sized bundt tin (2.4l, 10 cup, 10 inch). I recommend you use a simple design, as this is a fairly light mix. Soften the vegetable fat and then cream in the sugars in stages. Add the vanilla extract to the orange juice. Give the whole thing a quick mix for about 10 seconds or until well combined. It will no longer look curdled. It is quite orange though! Spoon the mix into the prepared tin and give it a good whack on the worktop to release bigger bubbles. Let it cool fully in the tin then turn it out. Allow to cool fully before dusting with a little icing sugar mixed with cinnamon. 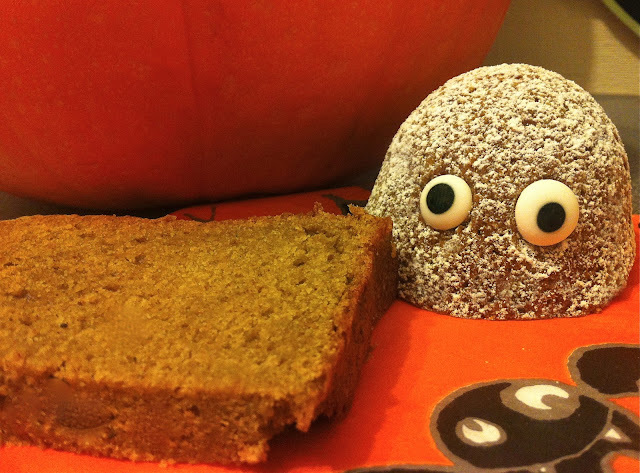 I love Starbucks Pumpkin Loaf and I'm guessing your bundt is even better! Loving the little googlie eyed man in your pic too!